The Gang-gang is one of only two cockatoos (the other being Major Mitchell's) with red anywhere on its head. Male-in general dark grey, the feathers scalloped pale grey/white; bright orange/red crest and head; secondary coverts suffused dull green; dark grey tail. Bill horn in colour. Eye dark brown. Female-dark grey head and crest; upperparts strongly barred with pale yellow, underparts heavily barred orange to green/yellow; undertail barred grey/white. As in female but with more red in crest (male) and dark grey crest (female); crest shorter with less filaments; more evident barring on tail. Described as croaking screech. Soft growling while feeding. Walk-in aviary, minimum length 4.5m (14.7 ft). Mix of small seeds: limited sunflower; walnuts, peanuts, pine nuts; fresh corn, fruit especially apple, hawthorn, cotoneaster and Pyracantha berries; complete kibble. Avid chewers so provide bird safe wood (fir), wood toys, vegetable tanned leather, pine cones; bathing. 1m (3.3 ft) long nesting log. 28-30 days, as low as 25 days recorded. Habitat loss, increased susceptibility to psittacine cirovirus disease (PCD) virus. Found in Australia from SE in E New South Wales through S Victoria to SE South Australia; introduced to Kangaroo Island. Occurs in tall open forest in highlands and foothills; in winter to open woodland, riverine woodland, scrub, farmland and suburban areas. Up to 2000m (6560 ft). Eucalypt seed pods, green acacia, Pyracantha seeds, berries, nuts, fruits and insect larvae. Nomadic; mostly found up in trees, only coming to ground level to drink; found in pairs or small family groups during breeding season; in winter larger groups up to 60. 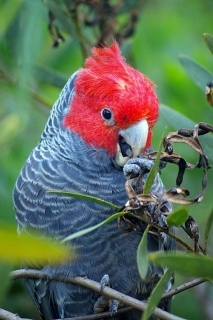 Article: Where's the Gang-gang Cockatoo?